In medium bowl, stir together yogurt sauce ingredients, reserving half of the mint for garnish; cover and refrigerate. Place chicken broth in small bowl, and add saffron threads. Set aside. Heat 10- to 12-inch skillet or Dutch oven over medium-high heat. Add butter; heat until foaming. Add chicken; brown on all sides, 6 to 7 minutes. Transfer chicken to plate, using slotted spoon. Add onion and salt to same skillet. Cook 2 to 3 minutes or until translucent. Add garam masala; cook 1 minute longer or until fragrant. Add broth mixture, stirring first if using saffron threads. Add chicken; stir to coat. Reduce heat to medium; simmer 3 to 5 minutes longer to allow flavors to combine. 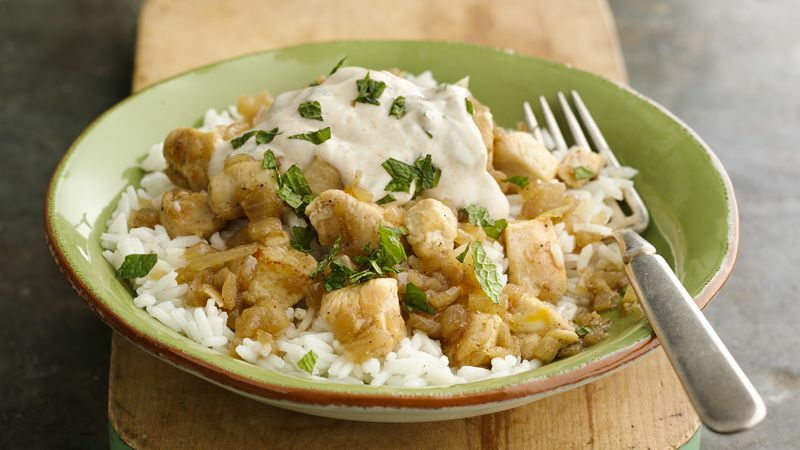 Divide rice among 4 shallow bowls; top with chicken mixture, yogurt sauce and remaining mint. Boost the veggies in this dish by adding 1 cup frozen sweet peas to the chicken mixture along with the broth. Just add 2 minutes to the cook time. If using a nonstick pan, increase cook time for chicken so it has time to brown on all sides.